One of the key benefits to having a humidifier in your child’s bedroom is that it prevents the air from being dry. This especially becomes a problem in winter when the air can dry out much more, particularly when your heating is robbing the moisture from it. Babies are much more susceptible to ailments such as runny noses, sore throats and infections. Having a humidifier in their room will add that essential moisture to the breathing air, which will create optimal breathing conditions, allowing your child to sleep comfortably and safely. 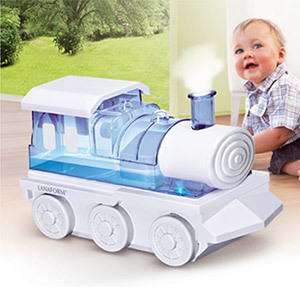 Specifically designed for young children, the fun and cute Trainy humidifier will appeal to all of your family members. Have you been looking for a humidifier for your child's bedroom? If so then you will adore the Trainy. The stunningly designed baby humidifier is perfect for children who suffer from respiratory disorders, who will benefit from the relief that moistened, humidified air brings, in order to breathe more easily, both day and night. You will love the simplicity in its ease of use, having a baby is stressful enough, so you’ll be pleased to know it’s nice and simple to set up and fill up too! The innovative ventilation system diffuses the cold vapour into the room, providing the desired and optimal levels of humidity, guaranteeing a peaceful night for your child – which in turn means a peaceful night’s sleep for you! Moreover, the diffuser boasts a tray for diffusing essential oils, so there’s no harm in borrowing it for yourself now and again is there? Put your feel up and add a little of your favourite essential oil. The Trainy Humidifier will also help your baby’s skin and relieve certain skin conditions such as eczema which cause itching, dryness and chapped lips. The rhythmic comforting hum of the humidifier can actually help your baby sleep too and will help drown out other potential distractions. If your baby suffers from dry skin conditions, dry nose or eczema then don'e hesitate to make make the Trainy Air Humidifier by Lanaform the new stylist addition to their bedroom.